company that takes a unique approach to payments and POS systems. The company provides vendors with access to safe, reliable and affordable payment processing solutions while sharing proceeds with charitable organizations that help save animals by providing access to medical care and placing them in compassionate homes.company that takes a unique approach to payments and POS systems. The company provides vendors with access to safe, reliable and affordable payment processing solutions while sharing proceeds with charitable organizations that help save animals by providing access to medical care and placing them in compassionate homes.company that takes a unique approach to payments and POS systems. The company provides vendors with access to safe, reliable and affordable payment processing solutions while sharing proceeds with charitable organizations that help save animals by providing access to medical care and placing them in compassionate homes.company that takes a unique approach to payments and POS systems. 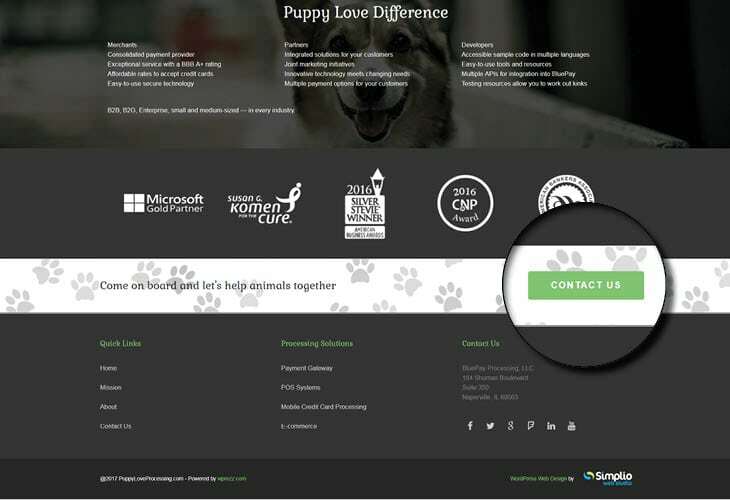 The company provides vendors with access to safe, reliable and affordable payment processing solutions while sharing proceeds with charitable organizations that help save animals by providing access to medical care and placing them in compassionate homes.company that takes a unique approach to payments and POS systems. The company provides vendors with access to safe, reliable and affordable payment processing solutions while sharing proceeds with charitable organizations that help save animals by providing access to medical care and placing them in compassionate homes.company that takes a unique approach to payments and POS systems. The company provides vendors with access to safe, reliable and affordable payment processing solutions while sharing proceeds with charitable organizations that help save animals by providing access to medical care and placing them in compassionate homes.company that takes a unique approach to payments and POS systems. The company provides vendors with access to safe, reliable and affordable payment processing solutions while sharing proceeds with charitable organizations that help save animals by providing access to medical care and placing them in compassionate homes.company that takes a unique approach to payments and POS systems. 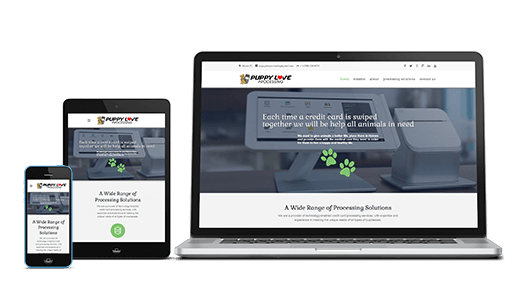 The company provides vendors with access to safe, reliable and affordable payment processing solutions while sharing proceeds with charitable organizations that help save animals by providing access to medical care and placing them in compassionate homes. 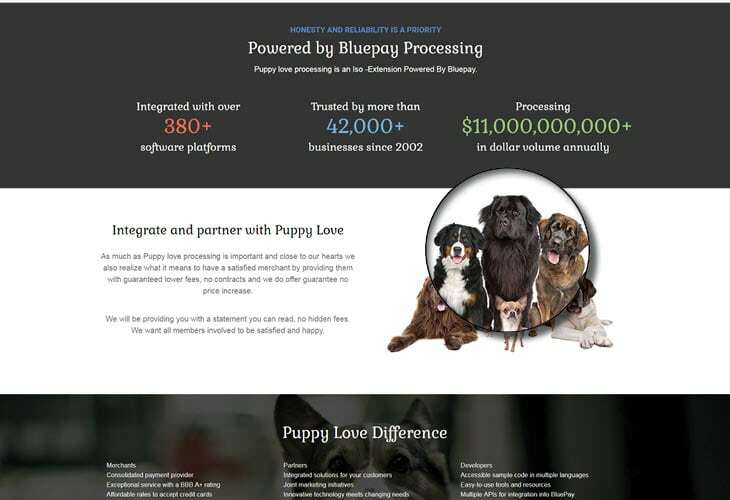 Puppy Love Processing is a company that takes a unique approach to payments and POS systems. 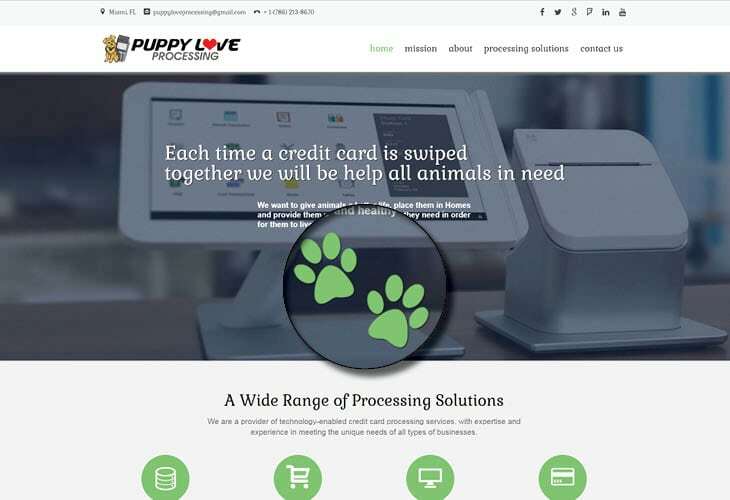 The company provides vendors with access to safe, reliable and affordable payment processing solutions while sharing proceeds with charitable organizations that help save animals by providing access to medical care and placing them in compassionate homes. The company has commissioned us to give their website a makeover. The result is a straightforward, modern website that highlights the company’s services. To give the website a slightly cute effect (to represent the cuteness of the dogs) we opted for the Gabriela font.